If you're like me and haven't been impressed by either side, how about voting for something we can all get behind - baked goods and pork products! 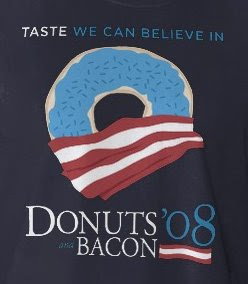 Donuts and Bacon are running mates made in heaven, and these tasty treats won't let us down with empty promises or more years in Iraq. You can support the cause by ordering your shirt from Zazzle.